He started to study piano at the age of three. As he showed exceptional talent, he was sent in 1962 to pass examinations at the Central Music School of Moscow and was admitted in the class of Evgenia Yarmonenko. He entered the Moscow State Conservatory of Music at the age of 17 and studied there from 1972 to 1977 with distinguished Professor Jacob Flier. In 1975 he won the First Prize at the Queen Elisabeth International Music Competition of Belgium. He left the Soviet Union in October 1978 and moved to Belgium. In 1979 he became a professor at the Royal Conservatory of Mons in Belgium. Since then, Mikhail Faerman is regularly invited to share his knowledge as a member of the Jury at the Conservatories of Brussels, Liege, Luxembourg, Paris etc. In March 1985 he participated in the Jury of the International Competition in Epinal, France. 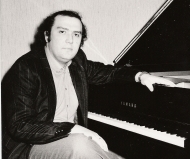 In September 1985, Mr. Faerman was invited to play the piano at the International Festival of Seoul in South Korea, where he gave a concert with orchestra and a remarkable recital. In November 1987 he was the president of the Jury of the First European Piano Competition. Since 1997, he is Professor of piano at the Royal Conservatory of Music in Brussels.